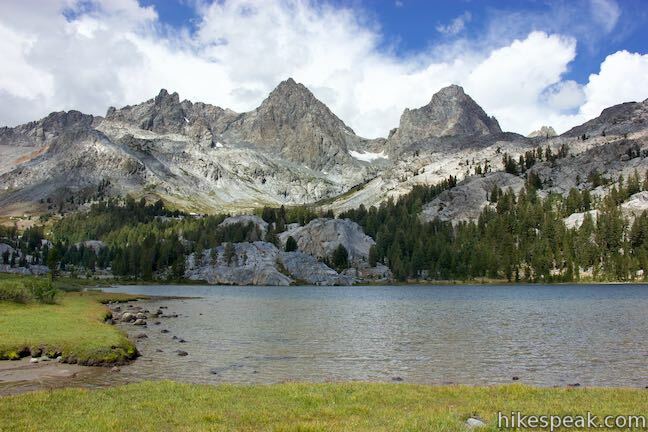 The Ediza Lake – Thousand Island Lake Loop is a top-tier backpacking circuit in the Sierra Nevada Mountains. Covering about 25 miles with 2,110 feet of elevation change, the loop is usually done in three days of hiking (not including any additional layover days). The loop starts and ends at Agnew Meadows, located near Devils Postpile National Monument and the city of Mammoth Lakes. 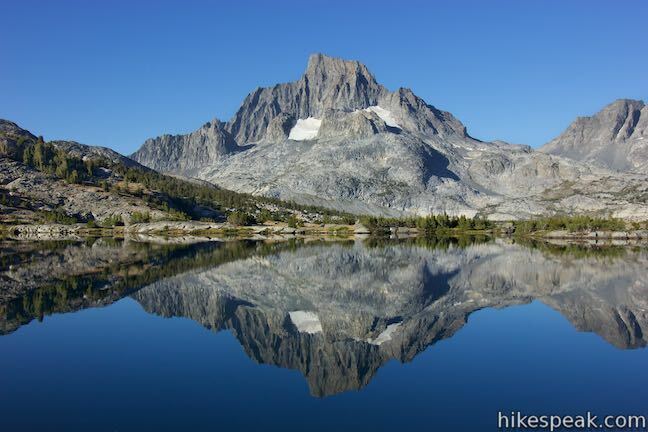 The loop incorporates sections of both John Muir Trail and Pacific Crest Trail while exploring beautiful landscapes in the Ansel Adams Wilderness of Inyo National Forest. Several beautiful lakes can be found along this loop, including three absolute stunners, Ediza Lake, Garnet Lake, and Thousand Island Lake. Each backcountry lake is located below soaring snow-shouldered summits. Set out on River Trail from Agnew Meadows. Hike down into a canyon to Olaine Lake and then take Shadow Creek Trail up to Shadow Lake and John Muir Trail. Take an upper section of Shadow Creek Trail up to Ediza Lake. Camp near the west side of the lake (per national forest restrictions). Consider an extension to Iceberg Lake. Hike back down to John Muir Tail and take this trail north over a 10,110-foot pass to Garnet Lake. Hike around the east side of this beautiful lake and go over a slightly higher pass to the north. 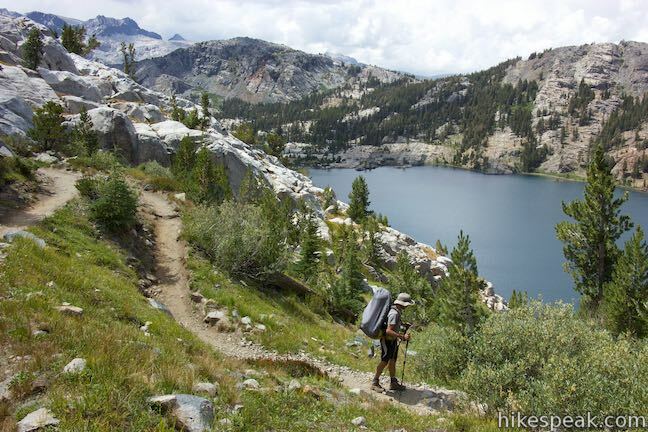 Cruise past two smaller lakes, Ruby Lake and Emerald Lake, to reach the outlet of Thousand Island Lake where John Muir Trail is joined by Pacific Crest Trail. Take a use trail along the north shore of the lake to find a place to camp (at least a quarter mile from the outlet, per regulations) and enjoy amazing views over the lake. 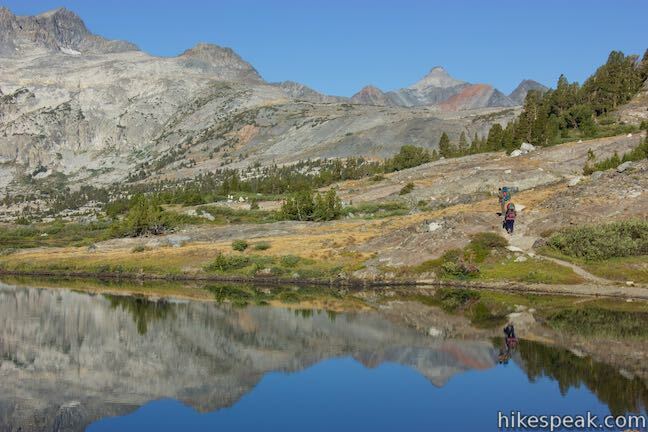 Hike out along the lakefront trail to the junction between John Muir Trail and Pacific Crest Trail. Leave Thousand Island Lake on the eastbound section of Pacific Crest Trail called High Trail. Go through junctions with River Trail and three routes to Clark Lakes. Cross slopes on the northeast side of a broad canyon to return to Agnew Meadows. One of the steepest parts of the hike lies between Garnet Lake and the pass to the south. If you hike the loop in a counter-clockwise direction, you’ll have to put in some good effort here and great views of the lake will be over your shoulder. Better to descend on this slope for head on views. High Trail delivers fantastic overviews of the scenery to the west. You might yearn for these panoramic views on your first day, but if you save this perspective for the final day, you’ll have a fuller appreciation of the terrain that you visited on the previous days. You’ll notice extra details based on those experiences and closing with High Trail lets you take in the sum of your backpacking accomplishment, which is a nice way to end. Most of the hike is a loop, but it does include a spur up to Ediza Lake. That lake should not be missed, but it could be could be cut to trim the trek by over four miles. Conversely, the trip can be extended by a couple miles by hiking past Ediza Lake up to Iceberg Lake to set eyes on another gem of the Sierra below the Minarets. Several other variations exist as well. Overnight camping is not permitted within 100 feet of lakes, streams, and trails. Camping is also banned in several areas along the loop. Camping is not allowed around Shadow Lake, along Shadow Creek, along the south and east sides of Ediza Lake, or within a quarter mile of the outlets of Garnet Lake and Thousand Island Lake. Check current restrictions when your obtain your permit. A permit is required for any overnight trips in Ansel Adams Wilderness and a trail quota is in place. High Trail has a limit of 12 permits that can be reserved in advance along with 8 walk-in permits. Shadow Creek Trail (which starts with River Trail and heads toward Ediza Lake) has a quota of 18 permits that can be reserved and 12 walk-in permits. A separate quota is available for River Trail for those who choose to continue up that trail toward Thousand Island Lake. River Trail has a quota of 18 permits that can be reserved in advance and 12 walk-in permits. 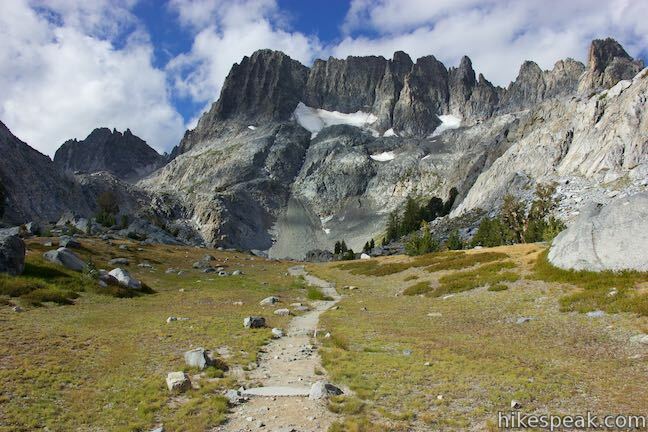 Permits for Inyo National Forest trailheads can be reserved at recreation.gov. Walk-in permits can be obtained at Inyo National Forest Ranger Stations starting at 11 a.m. the day before the first day of your hike. Arrive earlier than eleven, take a number, and wait in line if you are determined to get a walk-in permit. Mammoth Lakes Welcome Center is the nearest Inyo National Forest Ranger Station. The center is open daily from 8 a.m. to 5 p.m. and distributes permits and rents bear-proof canisters. The ranger station is located at 2510 Main Street (Route 203) on the road into Mammoth Lakes. While the permit has no cost (except an online processing fee), a fee is charged to take the shuttle or a vehicle on the road to Agnew Meadows. If you stay at a campground in the Reds Meadow Area during you visit (like Devils Postpile National Monument Campground), you are permitted to drive in and park at the trailhead. Those not staying overnight at a developed campground will need to park at Mammoth Mountain Ski Resort and shuttle in from there (get off at the first shuttle stop for Agnew Meadows). A $10 vehicle fee is charged to drive in. The shuttle charges by the individual (current pricing). From the Agnew Meadows Shuttle Stop, it is an additional 0.4-mile walk down a gravel road to the trailhead for River Trail. The trailheads at Agnew Meadows have small parking areas, toilets, and bear-proof storage lockers. Dogs are allowed on leashes on trails in Ansel Adams Wilderness. Campfires are not allowed above 10,000 feet and in several other restricted areas due to wildfire danger. While in the backcountry, food must be stored in approved bear-proof canisters. Follow “leave no trace” practices when disposing of waste. You may with to carry an SOS beacon and communicator. With about eight or nine miles to cover each day, the trek should be achievable by most hikers. The loop is incredibly rewarding with impressive views on every mile and lakes that are true beauties. More thorough descriptions and photos of each segment of the loop can be found in individual trail reports. Ediza Lake – Thousand Island Lake Loop is broken into these highlights: Shadow Lake, Ediza Lake, Iceberg Lake (optional), Garnet Lake, and Thousand Island Lake. To get to the trailhead: Take Route 395 to Route 203 and drive 3.6 miles to Mammoth Lakes. Turn right onto Minaret Road toward Mammoth Mountain. Reach the ski resort after 4 miles. Unless you are staying at a campground during your visit, park here and take the shuttle to Agnew Meadows. If you are driving in, go 1.4 miles past the ski resort to Minaret Vista Entrance Station where a 10-dollar fee is charged for each vehicle to continue down into the valley. Drive 2.6 miles down a narrow paved road to a horseshoe bend at the intersection with Agnew Meadows Road. Turn right and drive 0.4 miles to the trailhead at the end of the road (passing High Trail, 0.15 miles from the end of the road). This short extension off the trail to Ediza Lake heads to a higher lake in a sublime setting below a ridge of steep spires called the Minarets. This hike of 5.1 miles or more passes the Devils Postpile Formation to visit an attractive 101-foot waterfall with rainbows in its mist. Explore other destinations in Inyo National Forest and the rest of the range. 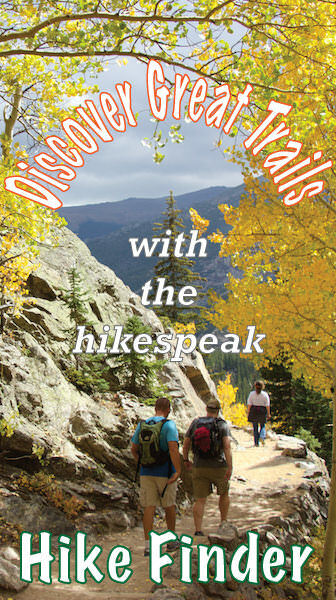 This is wonderful information and I would like to do some of these hikes. My problem is that I do not take my electronic devices on my hike and nothing will print from your site. Pictures print, but your trail directions do not. Not very helpful as I can’t memorize this information. Can someone please help this hiking grandma figure our how to print these pages? Sorry you are having an issue. This page should print with the text. Perhaps try another browser. Are you having issues with other websites? Try copying and pasting the info into Microsoft Word and printing that way! What do you think about doing this loop in 1 day? We are a group of experienced hiking women who prefer not to backpack. We hiked the Grand Canyon rim-to-rim hike last year (25 miles) and are looking for the next epic “day” hike. This looks perfect. Thank you! People definitely day hike in this area. If you’re comfortable with the mileage and start early, the loop could be done in a day. You might consider skipping Ediza Lake to shorten the distance of the loop or choose to hike to Ediza Lake & Iceberg lake and turning around there for a more manageable outing. ENJOY! I see you give multiple options for permits. Will any of those permits work to do the loop you described? Thank you! This is awesome. Thank you so much for all the detail. If I am looking to do the exact same thing which permits would I need and in which order? I would be looking to do it over 3 days. Would it be Shadow Creek then River Trail then High Trail? The permit you need (and the corresponding quota) is based only on the trail you begin on. You won’t need permits for any of the later trails. Since there will be a road closure for Reds Meadow Road on October 9th for road repairs, will I be able to park anywhere in the vicinity of the Minaret Vista Entrance Station so I may hike from there to access the Ediza trails? Is overnight parking allowed near the vista? I’ll answer my own question. Yes, overnight parking is allowed at the Minaret Vista Entrance Station. Do you have a gpx file with the waypoints shown on your map that you would be willing to share? Hi- This is not a feature that is currently available, but may be offered in the future. Enjoy the hike.